Does Dionysus, god of wine and the theatre, demand sacrifice? In this third Laetitia Talbot mystery, the theme is revenge, and someone will stop at nothing to achieve it. The Prologue opens in ancient Mycaenae, circa 1200 B.C. A man—too old to go off and fight in the Trojan war—serves as lookout for the bonfires that will signal the Achaean victory over the Trojans. Soon Agamemnon, High King of Hellas, will set sail for home and an appointment with death. Flash forward thousands of years, and Chapter One introduces another king. This time, it is the exiled King of Greece, George II, who is getting ready for an evening at the London Opera. His plans change when he receives an unexpected visit. He tells his valet that he will be out late and talks of “slaying dragons”. Chapter Two switches scenes and characters. Chief Inspector Percy Montacute of Scotland Yard learns that he will be transferred to Greece. There, he is to meet a scholar, Merriman, who is in need of surveillance. Professor Andrew Merriman is an archaeologist of a sort. He is working on a biography of Alexander the Great and soon plans to stage a new translation of Aeschylus’ tragedy, Agamemnon. The true start of the story begins with Chapter Five, which is set four months later in October 1928. This language recalls the novel’s prologue, but soon phrases such as “the rumble of traffic, the pealing of a church bell” clue us in. We are now at the dress rehearsal of Agamemnon. Laetitia Talbot is a near audience of one as she watches the performance proceed until it comes to a crashing halt when–instead of a staged dummy–a very real corpse turns up in the bath. When and how the victim was stabbed will be very crucial questions in solving this case of murder. Surprisingly on the scene is our Chief Inspector Montacute. As intimated in Chapter Two, he has taken a role in Merriman’s production of Agamemnon, and after revealing his identity, he takes charge of the scene and enlists Laetitia’s aid in recording the names of those present. No trace of a weapon is found, and the witnesses/suspects are sent home in due course. Before dawn breaks, another death occurs. Was the victim’s fall from the balcony accidental or precipitated? In an essay at the end of the book, author Barbara Cleverly mentions how historical fiction is like stepping into an Alice-in-Wonderland world where reality and imagination collide. A Darker God cleverly incorporates some very real characters. The author cites Alexander the Great as the first, but he’s not so much a character as a presence that overshadows part of the story. More immediate are: Eleutherios Venizelos, the then current prime minister of Greece; his British-born wife, Helena Schilizzi; and the deposed King of Greece, George II. Although only the latter two actually make an appearance in the story. In any good historical tale, one learns a little something about the time period, and A Darker God delivers. Foremost is an affair that is known as “The Population Exchange Between Greece and Turkey.” Five years before the start of the novel, in 1923, European politicians signed a treaty that resulted in the displacement of over two million people. Based along religious lines, Greeks who identified as Muslims were forced to emigrate to Turkey, and Christians in Turkey were likewise forced to emigrate to Greece. Thousands sailed across the Aegean and endured hardships to survive in this new regime. And this travesty sets in motion a revenge scheme important to the plot. Other topics include: a brief history of Alexander the Great, his mother Olympias, and his father Philip of Macedonia; Aeschylus’ Greek drama, Agamemnon, and the legendary figures who inspired it; and a little Greek mythology, particularly Dionysus and Demeter and the Eleusinian Mysteries. Although, I’d say readers familiar with the later two topics might enjoy the story with more ease. 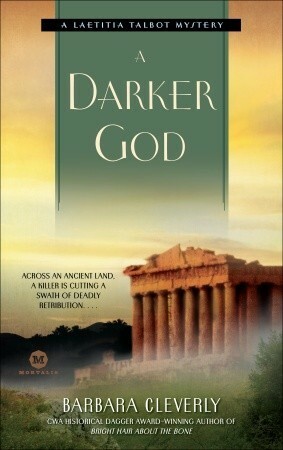 A Darker God was an enjoyable mystery. Perhaps it could have been a shade shorter, but by the end of the story, some early chapters made more sense. This is actually the third book in the Laetitia Talbot series, but it reads almost like a first in the series book. In fact, not having read the previous books, I thought Montacute might make a good romantic interest for Laetitia, but William Gunning–having appeared previously in the series and again here–already had that role. Interestingly, the first book in the series, The Tomb of Zeus, is really the second chronologically. Bright Hair About the Bone is technically the first though it was published second. Author Cleverly is perhaps better known for her British Cmdr. Joe Sandilands series, set primarily in British Colonial India. Recommended for those who enjoy such post-WWI era series like Carola Dunn’s Daisy Dalrymple or Jacqueline Winspear’s Maisie Dobbs or for those who like archaeological inspired mysteries like Elizabeth Peters’ Amelia Peabody.